Raised in the less-than-glamorous surroundings of Greenville, North Carolina, Moses Barrett received his first exposure to music in the Southern church attended by his family, and was taught to sing at school not long afterwards. While still very young, he was forced to deal with the death of one of his close friends -- and it was in tribute to this friend that he would later adopt the "Pablo" half of his stage name Petey Pablo. At the age of 13, the young man left home to take some of the financial burden off of his mother; it was around this time that he developed an interest in hip-hop and began rapping with local groups. Due to a natural ability, his musical activities quickly began developing into a proper career -- a development that was temporarily derailed at the age of 19, when he was given a six year sentence for armed robbery. He continued to perform while in prison, impressing his fellow inmates and even the guards with his talent. After his release, Pablo made the decision to escape the dead end that North Carolina had become for him, and soon relocated to New York City in order to have access to its more active hip-hop community. New York was not immediately welcoming to the Southern rapper, and Pablo made a brief return home to North Carolina before attempting the move a second time. 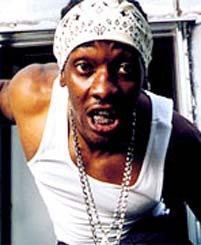 This next attempt proved to be much more productive, and eventually he managed to connect with established performers such as Busta Rhymes and fellow "Dirty South" rapper Mystikal. It was while improvising with friends Black Rob and Doug E. Fresh in a NYC bathroom that Pablo's career was at last given a proper launch, due to the fortuitous entry of the head of A&R for Jive Records: the executive immediately recognized the rapper's talent and, upon discovering that he was unsigned, took the opportunity to offer Pablo a record deal. Things developed quickly after that, with many of the industry's leading names seeking to work with the hot new property. Guest appearances on Mystikal's Let's Get Ready and on the remix for Black Rob's single Whoa! in 2000 introduced him to the hip-hop listening public at large, setting up the release of his debut album The Diary Of A Sinner: 1st Entry the following year. The record distinguished itself from most of the year's releases through its subject matter, the focus being more on life issues and personal struggle and less on the usual "ballin'" and "bling" crowing. With production input from Timbaland (and some vocal contributions from Tweet) both the album and it's first single Raise Up made a strong showing on the mainstream and hip-hop charts. After Raise Up faded from the charts, Pablo Petey's career appeared to be taking a similar course: a follow-up album scheduled for 2002 was put on indefinite hold by his label, and guest appearances on other artist's tracks became scarce. In 2004 this apparent decline was abruptly dispelled by the release of the Lil' Jon-produced single Freek-A-Leek, which once again brought Pablo high into the charts. The second album Still Writing in My Diary: 2nd Entry was finally released later in the year -- once again with input from Timbaland, and once again making its own journey into the single-digit ranks of the rap and mainstream charts. Pablo also made an appearance on singer Ciara's female point-of-view response to Freek-A-Leek, Goodies, also produced by Lil' Jon.